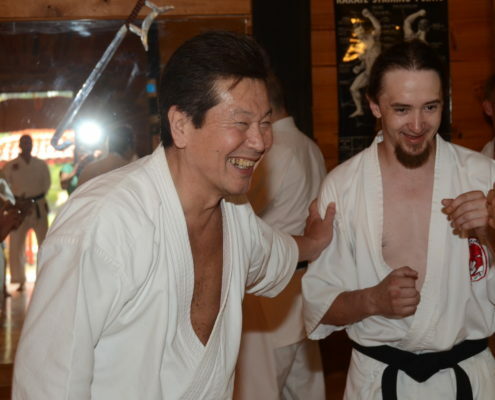 I met my Karate teacher and mentor Ohtsuka Tadahiko by accident. 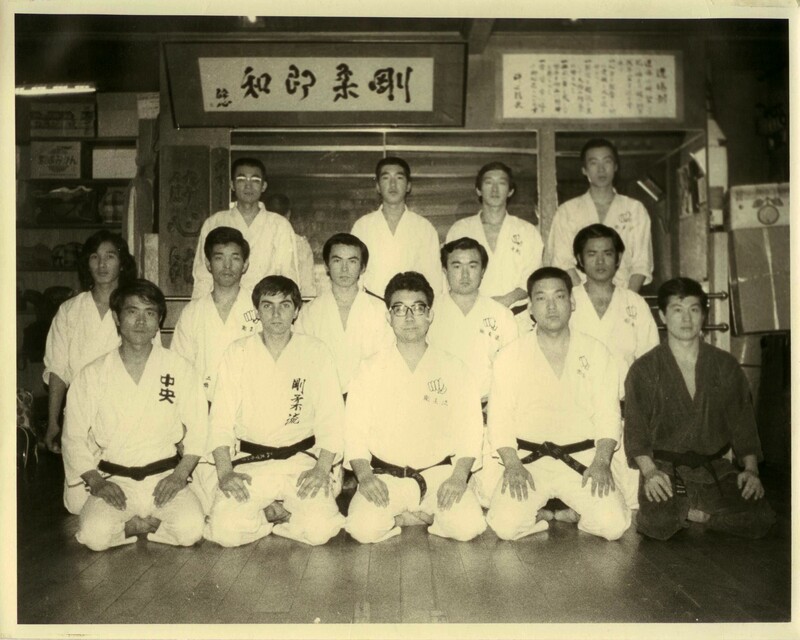 I was twenty years old, never been out of Australia let alone travelled to faraway Japan but eager to begin my journey studying Goju Karate under Gogen Yamaguchi Sensei. 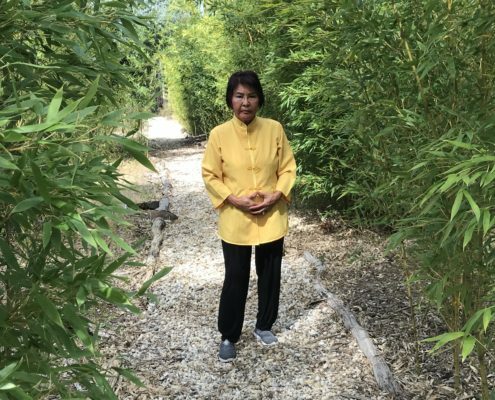 The entire trip was spontaneous and unplanned; to this day I do not know why we boarded that plane to Tokyo in the summer of 1974; all I can say is that it seemed like a good idea at the time. 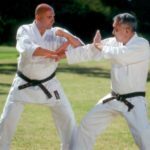 My preparation for the trip consisted of my Principal Karate teacher in Australia, Mr. Tino Ceberano, the then head of Goju Kai in Australia and one of the pioneers of Karate in my country writing down Yamaguchi Sensei’s name and address of his dojo, Zen Nippon Karate-do College; and I did not even know if he would accept me as a student. 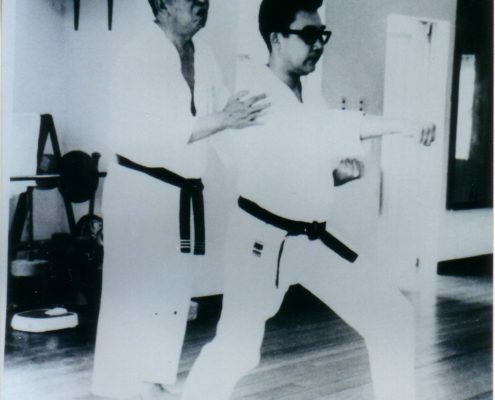 James Sumarac training at All-Japan Karate-Do College in 1974, while “The Cat” Gogen Yamaguchi observes. Arriving in Japan, we received a rude awakening; no one in Tokyo spoke English. This was a problem, as neither my partner Toni nor I spoke a word of Japanese. We hid in our cheap hotel room for several days, clearly out of our depth. Finally, I plucked up the courage to leave the hotel. Approaching a nearby taxi but not speaking Japanese, I had no way of describing where I needed to go or whom I needed to see. So I just gave the taxi driver the scrap of paper with Yamaguchi Sensei’s name and address on it, and hoped for the best. Little did I know that there is a philosophy in Japan that Japanese people are ambassadors for their country; they will go out of their way to assist foreigners. Whenever I have visited Japan I have had locals help me with my suitcase up flights of stairs, and even miss their stop on the train to see that I safely arrived at my destination. The taxi driver therefore was a Good Samaritan, and, instead of taking me to Yamaguchi Sensei’s dojo, took me to a Goju Ryu dojo closer by; he thought this was the decent thing to do. However, he did not know exactly where the dojo was. So, I found myself dropped off in the middle of a maze of alleyways in a strange suburb, without a clue where we were. When we got out of the taxi, I found myself embroiled in a sudden Tokyo typhoon. It was pouring rain, so I ran to a little corner store and bought an umbrella. No sooner did I step out of the shop, when the violent wind snapped the umbrella inside out . 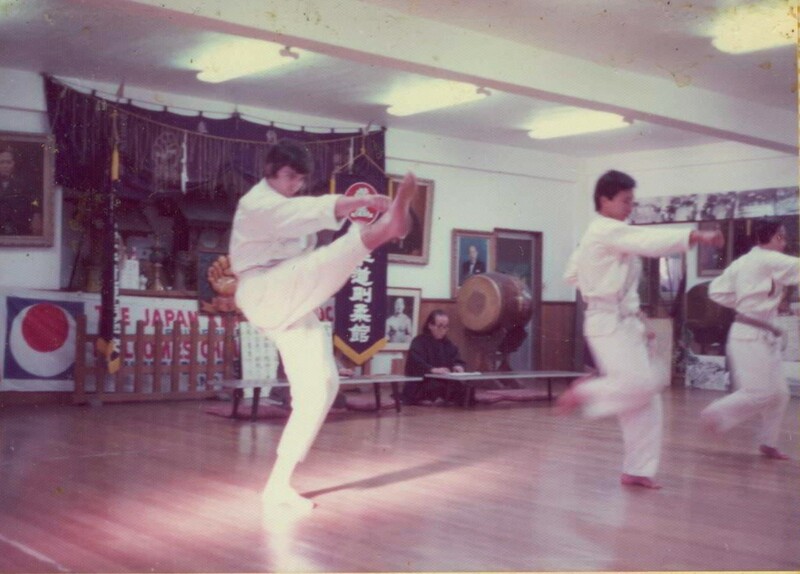 It was then that a stranger, Shuji Sakuma (who strangely will appear in my life again)*, approached me, and, seeing this as an opportunity to practice his English, asked ‘can I help you?’ I explained that I was looking for the Karate dojo. He said ‘I have lived here all my life. I know there is one around here somewhere. 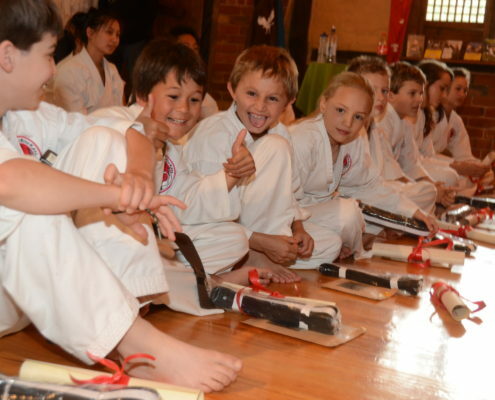 Let’s look together.’ Shuji Sakuma was right; eventually, after walking around in the rain and enquiring at shops and houses, we found a Karate dojo. 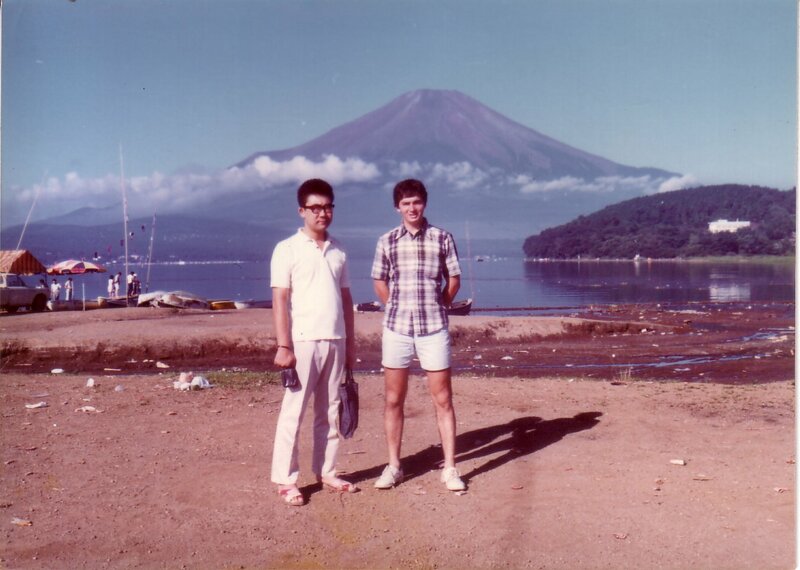 James Sumarac and Master Tadahiko Ohtsuka at Lake Yamanaka near Mount Fuji on summer vacation, 1974. An energetic man in his mid thirties opened the door wearing a maroon Adidas tracksuit. 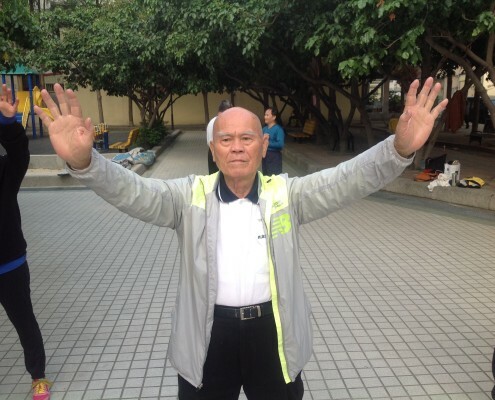 He grabbed my arm and dragged me out of the rain inside his home, which was also a karate school. Shuji excused himself after several bows to each other he departed into the storm. My hair was dried with lightening speed and my drenched sweater replaced with a dry one, as his wife Kazouko San served me hot tea and strange Japanese buns. Interestingly he didn’t ask who I was; he was only concerned with making sure his unexpected guests were warm, dry and comfortable. 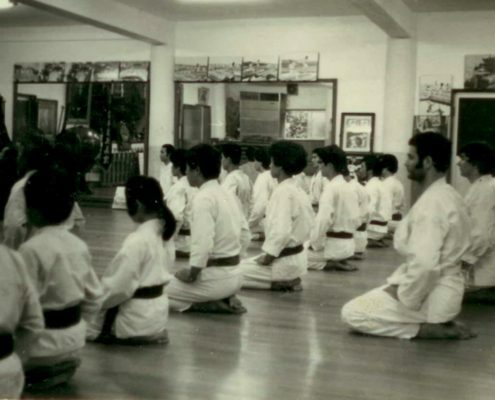 I was relieved; this must have been the right place, as it was clearly a karate dojo, with its wooden floor, traditional karate equipment, including straw makiwaras (striking post for focus training) and full-length mirrors. Traditional Japanese karate dojos consist of the dojo at the bottom of the building, and the Master’s residence on the top. It gradually dawned on me that this man was not expecting me. This man had no idea who I was. I now, finally, realised that I had been taken to the wrong dojo. I told him I came to Japan to study karate with Gogen Yamaguchi Sensei in the Goju Kai School. 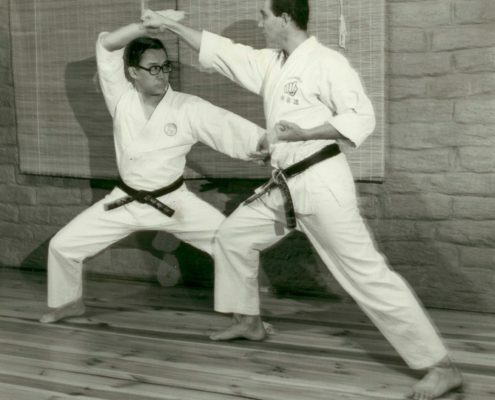 He laughed and said yes this is Goju Ryu but “Another school, but I will take you there.” Ohtsuka Sensei rang Yamaguchi Sensei, explained who I was, and we were on our way. Impulsively, I asked “Since I am living close by, can I train here?” Ohtsuka Sensei said “no, not possible,” and I left it at that. Ohtsuka Sensei then proceeded to drive me across Tokyo to Nishi Ogikubo in his tiny 60’s Subaru. As we drove through the torrential downpour, I found myself very quickly developing a rapport with Ohtsuka Sensei. I quite naively asked him once more if it was possible to visit his dojo and train. 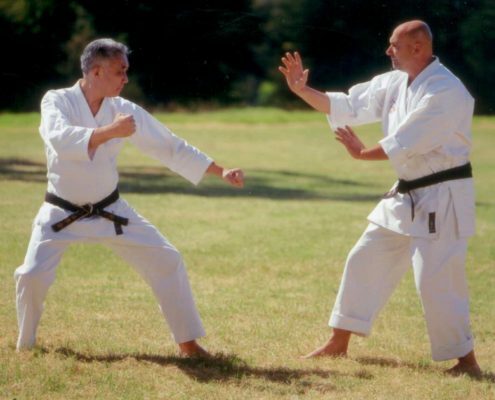 Ohtsuka Sensei explained to me that karate etiquette in Japan would not allow me to train at two dojos at once. I was confused and disappointed, but was left with a sense that I would like to train with him one day. This initial meeting was an extraordinary experience, of compassion and kindness, and one I have never forgotten. Little did I know that this fortuitous encounter would shape my entire life. 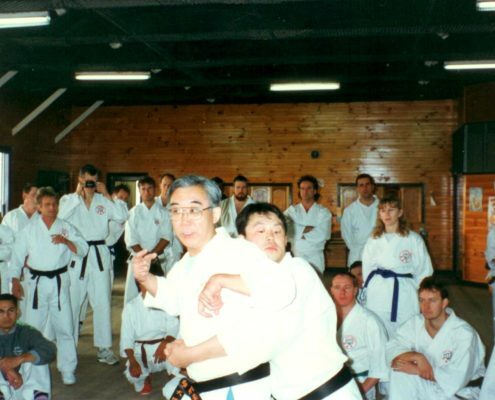 This is a peek into of one of many stories included in a text to be released mid 2018 titled “The Living Bubishi,” a practical Martial Arts manual with an explanation of the 48 illustrations of the Bubishi and stories of how Ohtsuka Sensei impacted Martial Arts in Australia and beyond. 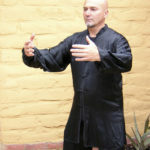 Muchi Te (Whipping Hand) Beginning Tai Chi: Where Do I Start?